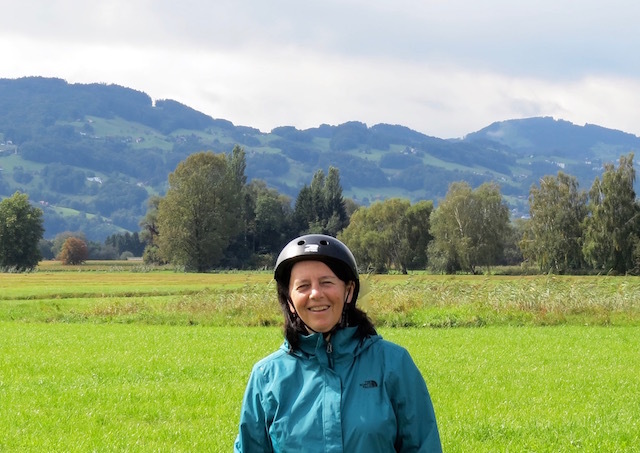 Bike Trip Boden See | What Next? On our bicycle trip in Europe Dave and I really loved the bedding in our hotels. 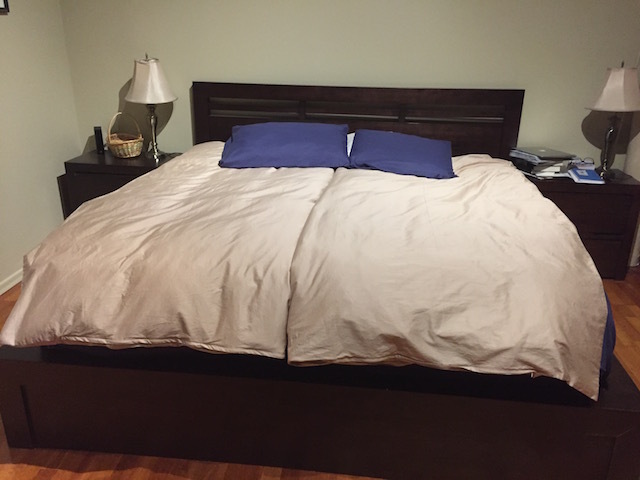 We usually had a king size mattress to share but we didn’t have to share a blanket as each bed was outfitted with a pair of duvets, folded over and placed on their respective sides. This eliminated any tussling over the same blanket during the night. We decided we would like to try a similar thing in our condo bedroom. When we got home Dave ordered a pair of goose down duvets and now they’ve arrived. I had already found matching duvet covers and after slipping our new duvets inside we were ready for our first night at home sleeping European style! 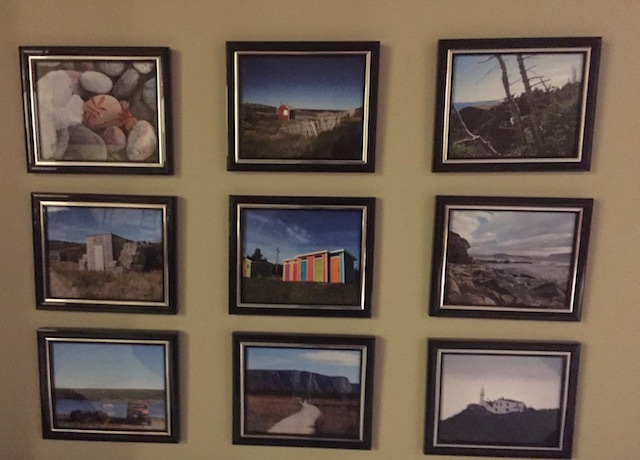 Last year I solicited opinions from my blog readers to help me choose photos of our trip to Newfoundland to make a display for a wall in our condo. On Friday I replaced those Newfoundland photos with pictures from our recent bike trip to Europe. Here are the nine images I chose for the new display. Before we left on our cycling trip in Europe I downloaded three books on my Kindle, one for each of the countries we would travel through. 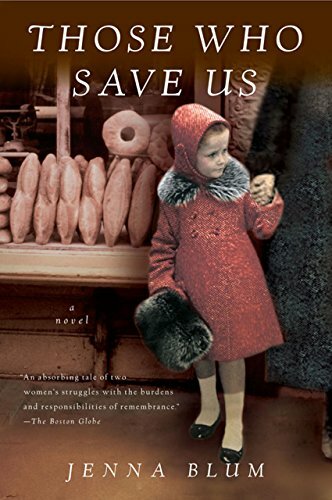 My German book was Those Who Save Us by Jenna Blum. Trudy is a Minneapolis history professor searching for the truth about her childhood. She won’t learn anything from her mother Anna who stubbornly refuses to talk about the past. We find out Trudy’s father was a Jewish doctor captured by the Nazis. Anna becomes the mistress of a German military man in order to save Trudy’s life. After the war an American serviceman marries Anna and brings her and Trudy to the United States. Trudy believes she is the daughter of the SS officer, who she can vaguely remember. This knowledge colors her whole life. Things change when Trudy undertakes a history project interviewing German war survivors living in America. I chose the classic Heidi by Johanna Spyri for my Switzerland book. I had not read it since my childhood. 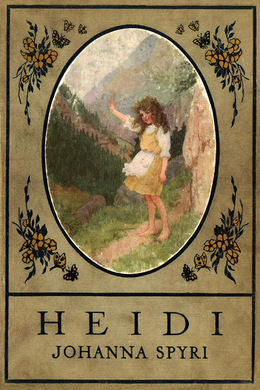 Heidi was written in the 1880s and I wondered if Heidi was the inspiration for female heroines of the early 1900s like Pollyanna in America, Anne of Green Gables in Canada, and Mary Lennox in England’s The Secret Garden. These are plucky, independent young girls who have had difficult lives and yet remain hopeful and are a positive influence on those around them. One thing I had forgotten about the book Heidi was how religious it was and how faith plays such a key role in the lives of Heidi and her embittered grandfather. 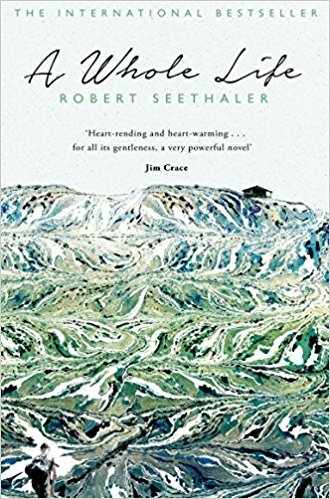 In A Whole Life by Robert Seehalter we are provided with a spare, simple, unemotional and honest look at the entire life of an ordinary Austrian man named Egger. He has a horrific childhood, a varied work career where he labours incredibly hard but is always a dedicated employee, a brief time of quiet married joy, a stint in the army that leaves him a prisoner of war, and then a retirement where he guides tourists on treks in the Austrian Alps. 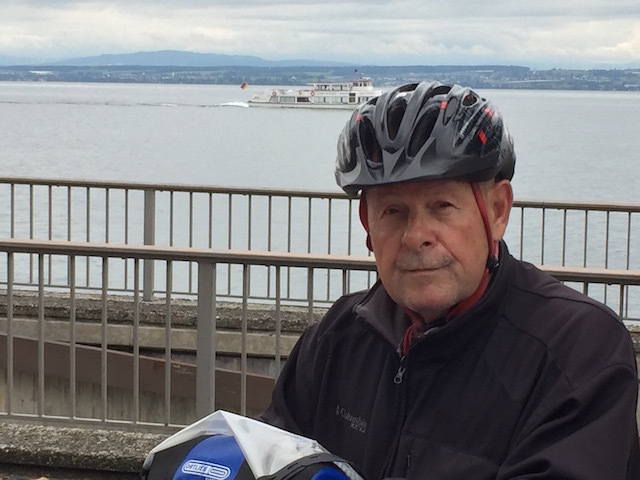 Outwardly there would seem to be little that is remarkable about Egger’s life but the fact that he is able to find inner calm amidst the difficulties of day-to-day living and accept his lot in life is remarkable. From Those Who Save Us I gained an interesting perspective on the holocaust in Germany. 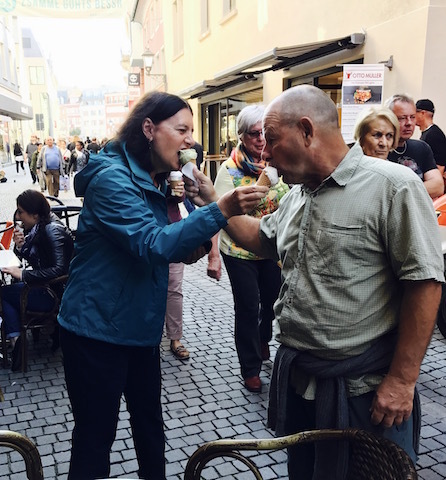 From Heidi I enjoyed absolutely beautiful descriptions of the Swiss countryside and In A Whole Life I saw Austrian history and geography through the eyes of an ordinary man. 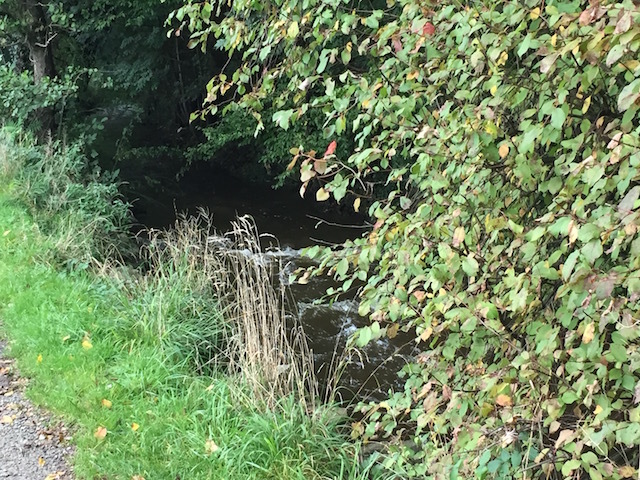 Other posts about books and travels………. Today we hung around in Konstanz, Germany. There is plenty of lovely old architecture left there. That’s because the city was not bombed by the allies during World War II thanks to geography. Standing at the border between Kreuzlingen Switzerland and Konstanz German. Konstanz is really a twin city of a Swiss town called Kreuzlingen. Allied bombers left Konstanz alone because they were worried about accidently bombing Kreuzlingen and thus violating Switzerland’s neutrality. Konstanz citizens left all their lights on at night so that allied pilots would not be able to differentiate Konstanz from Kreuzlingen where citizens also left their lights on to alert allied pilots. 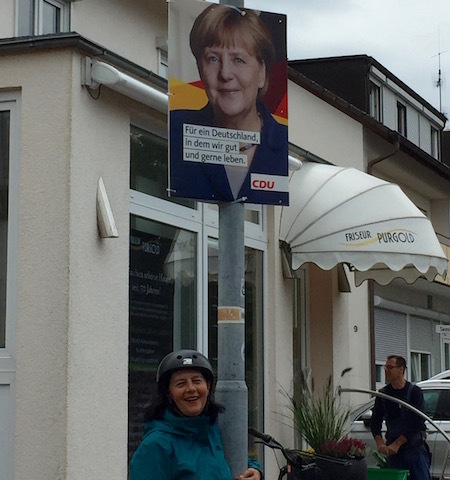 We learned about this at the Rosgarten Museum in Konstanz which we visited today courtesy of a free coupon from our bike tour company. A display on the top floor told the story of the fate of the Jews in Konstanz during World War II. They were transported to Gurs, an internment camp in France. Those who didn’t die there were sent to Auschwitz where they were murdered. We sat in the sunny courtyard of the museum later enjoying the free coffees also provided by our coupon. Dave read more about Konstanz history in the museum guide. As we walked through the streets of Konstanz my sister pointed out this men’s clothing store. Kaaren and I grew up in a community called Steinbach. Here was a clothing store with the name of our home town in reverse. Bach Stein. We ate delicious lamb doner kebabs for supper. The owner chatted with us as we ate. He is a Kurdish immigrant and has been quite successful in Germany. He also owns two businesses in Stuttgart. After supper we had pastries and coffee in the city square and listened to a band covering American music by the likes of Cat Stevens and Elton John. Then it was off to bed. Tomorrow we head to Zurich and then on to Iceland for the second leg of our trip. And just like that our five-day biking trip is over. Our last day of cycling was fairly easy compared to the previous four. The weather was absolutely lovely, sunny and just cool enough to make for pleasant riding. 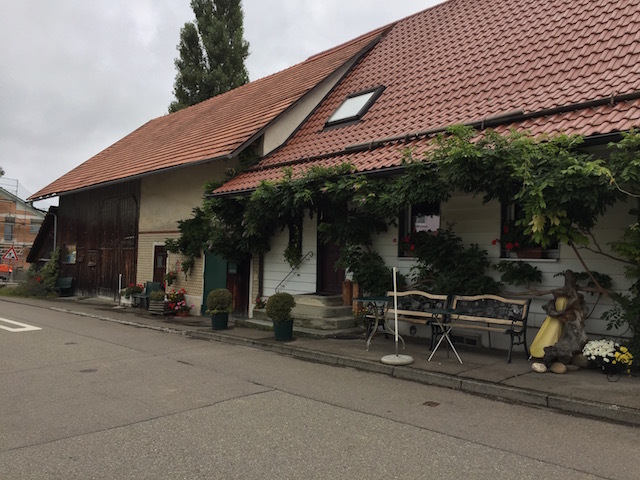 We were biking mostly in Switzerland today and saw house barns along the way. The house was attached right to the barn just like some of the houses in my grandparents’ village of Gnadenthal in southern Manitoba and like the house at the Mennonite Heritage Village Museum in Steinbach. 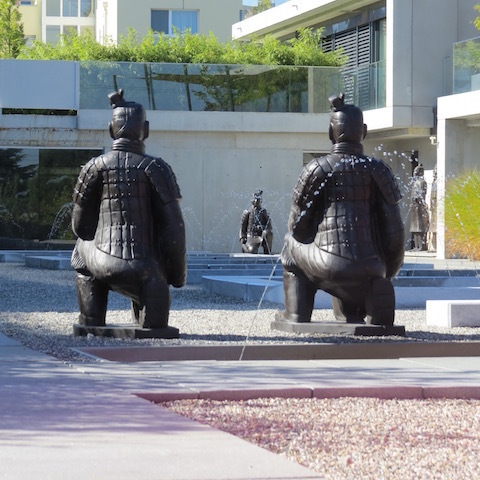 I had to stop and photograph these terra-cotta warriors around the swimming pool at a luxurious apartment complex overlooking the lake. 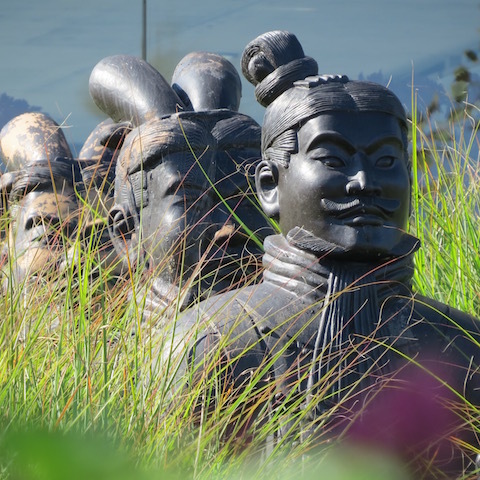 Dave and I visited the site of the real terra-cotta warriors in Xian China and so it was somewhat startling to see these giant reproductions in the middle of Germany. 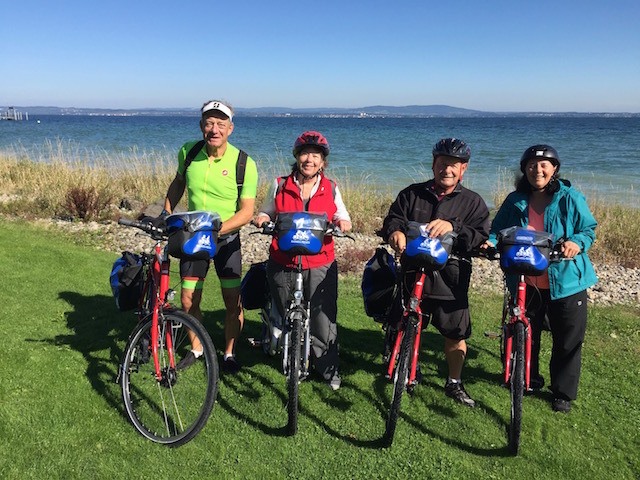 We decided since it was our last day we should have our photo taken with our bikes beside the beautiful Boden See which we have been traveling around all week. This very polite and kind young man named David who was resting on a park bench agreed to take our photo. 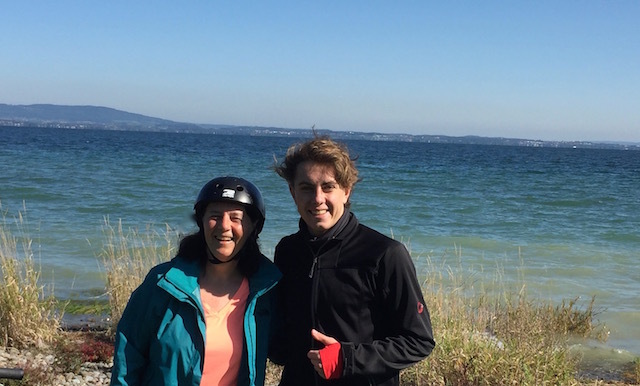 He told us he was on one last cycling excursion before starting his university year in Munich where he is studying to be an industrial engineer. He even took a panoramic shot of our group. 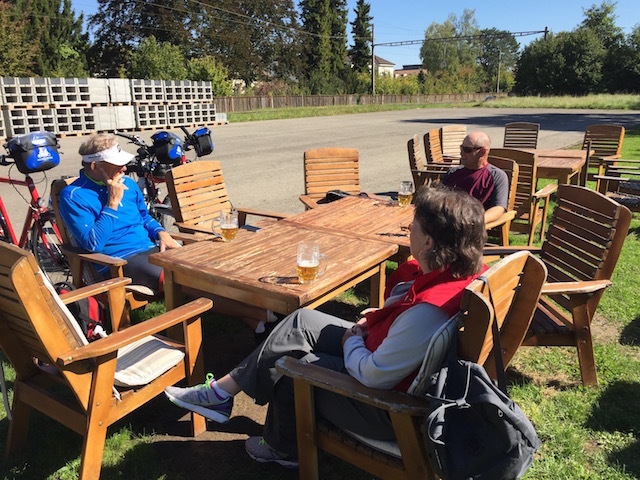 We stopped at noon for a drink at a little place along our bike path where we met a couple from Connecticut who have cycled in many different places. They recommended our next trip should be cycling the heel of Italy’s boot. 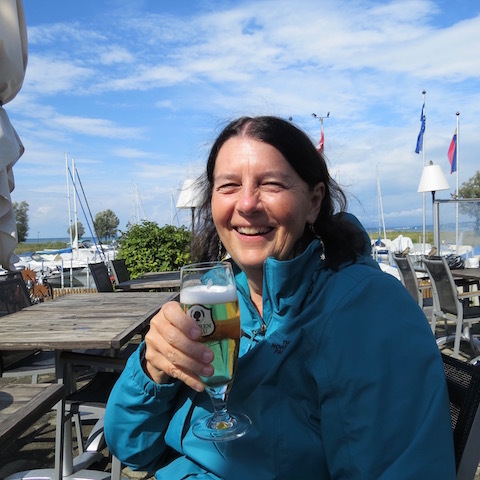 Once we arrived back in Konstanz we checked back into the Hotel Halm where we stayed at the start of our journey. Dave has been looking for a gelato place all along our route and he finally found one this afternoon so we had to stop. Over an excellent dinner last night at a Singaporean restaurant we reflected on our great bike trip and the good quality of the tour company who organized our route, provided our sturdy and reliable bikes, reserved our hotels for each night and ferried our luggage from place to place. We would happily book a tour with them again. After a day of rest here in Konstanz we will be off to Iceland for the next stage of our journey. I drank a beer in Austria. That may not seem like a big deal but I don’t like the taste of beer and I NEVER DRINK BEER. 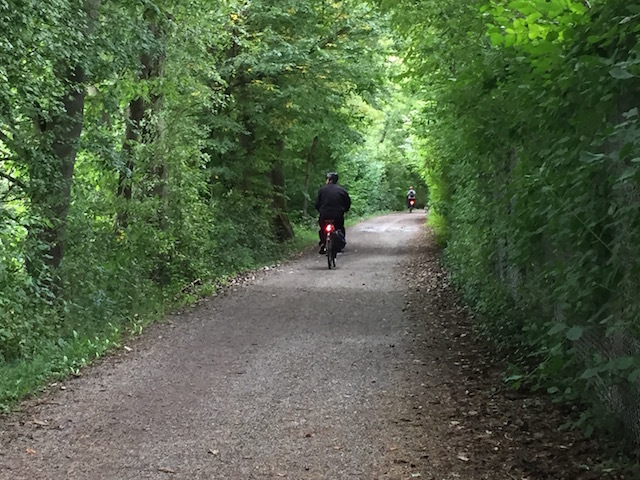 It all started when we got a little bit off the prescribed biking route today. 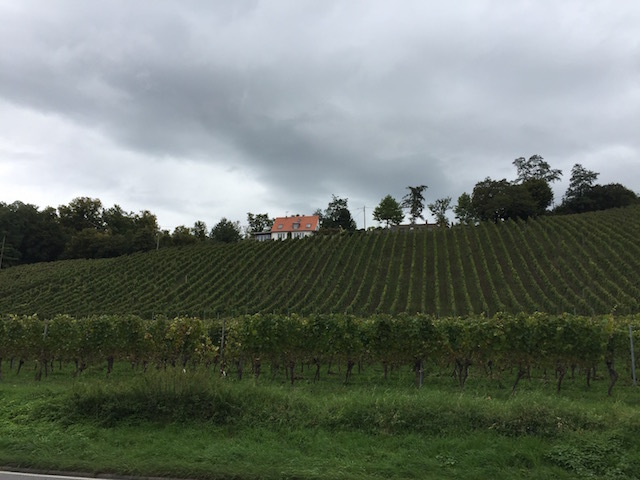 We were seeing some amazing Austrian scenery on our detour but we wondered if maybe we had added an extra twenty or more kilometers to our day. Then we saw this couple having a beer on an outdoor patio beside the bike path. We asked them if we were on the right road to Rorschach where our hotel for the night was located. “We live in Rorschach,” the man said. “And this path will take you right there. It is the best path. 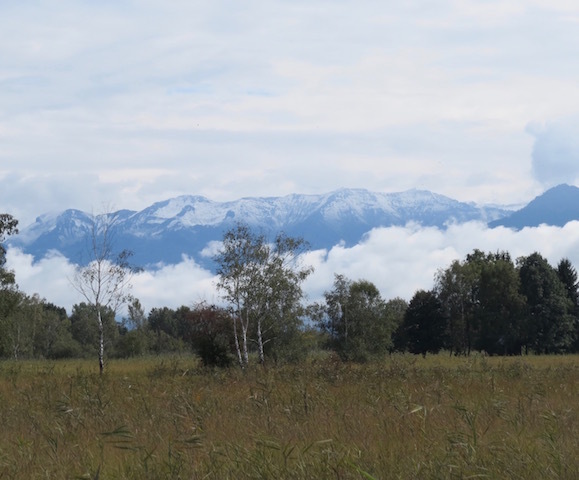 The most scenic one.” He also told us we had only gone about 5 kilometers out of our way. We were so happy to hear this we decided to celebrate by having a beer too. I never drink beer but Dave said he would order me a Raedler which is a grapefruity kind of beer and to make him happy I should try to drink it. I did and thought it was surprisingly good. 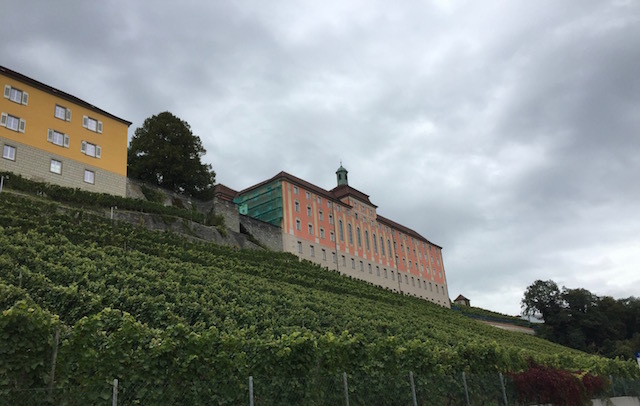 We biked 56 kilometers again yesterday and spent the night at the quaint Mozart Hotel in Switzerland, crossing the border from Austria near the end of our biking day. 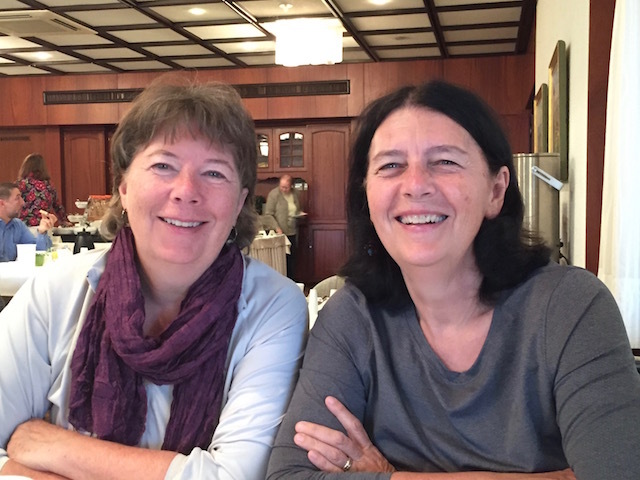 Dave took this picture of me and my sister at breakfast yesterday morning. The breakfasts at all our hotels have been wonderful. At least a dozen different kinds of fresh bread and buns, all kinds of cold meats, a variety of cheeses, fresh vegetables and fruits, a yogurt bar with an array of toppings, eggs and bacon and sausages, and a variety of jams and jellies. 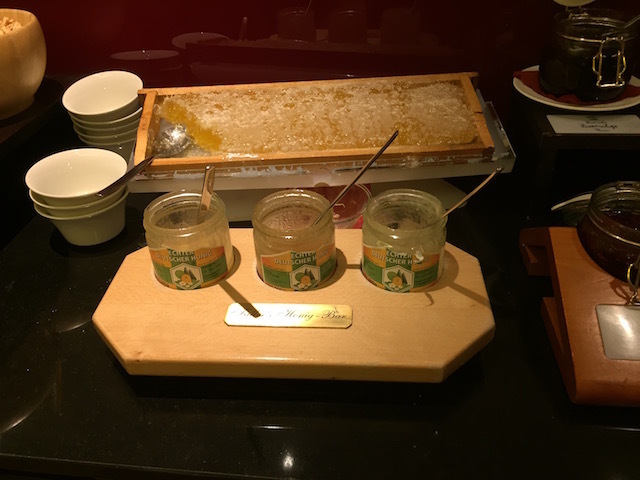 One morning there was even a honey bar complete with a whole comb of honey right from the hive. 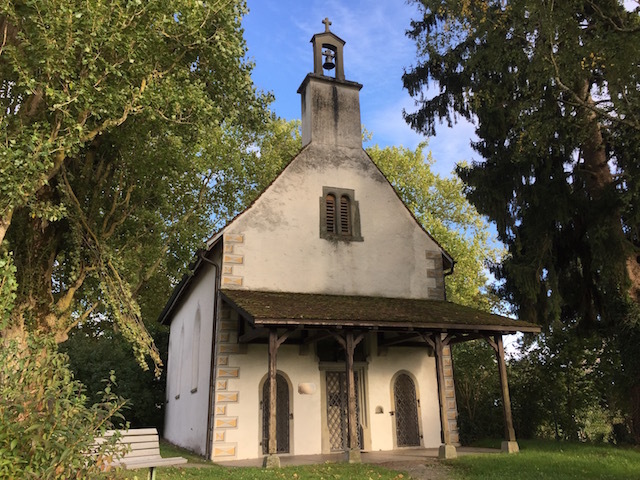 Near our hotel in Uberlingen was this chapel dedicated to St. Leonard. Since my church was learning about different saints this summer I checked out what St. Leonard was famous for. Apparently if prisoners prayed to St. Leonard their chains broke and they were free. 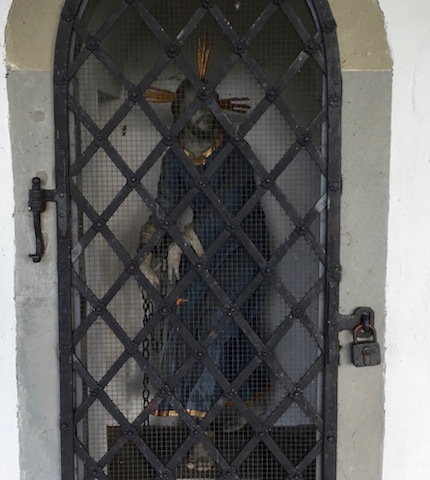 That explains why St. Leonard is depicted this way outside his chapel with a barred door and carrying chains. 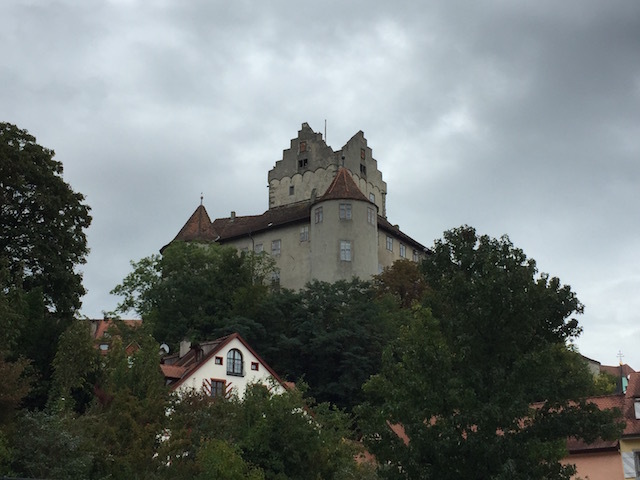 There are more than 20,000 castles in Germany and we have cycled by quite a few of them, including this one. 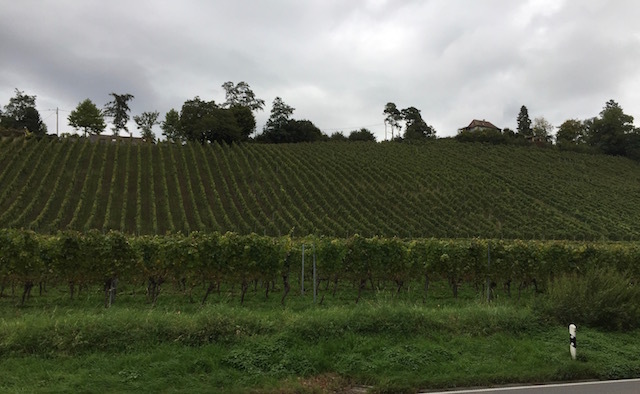 Yesterday we cycled by vineyard, after vineyard on steep hills. Dave figured you would need to be as fit as a mountain goat to work in these vineyards. 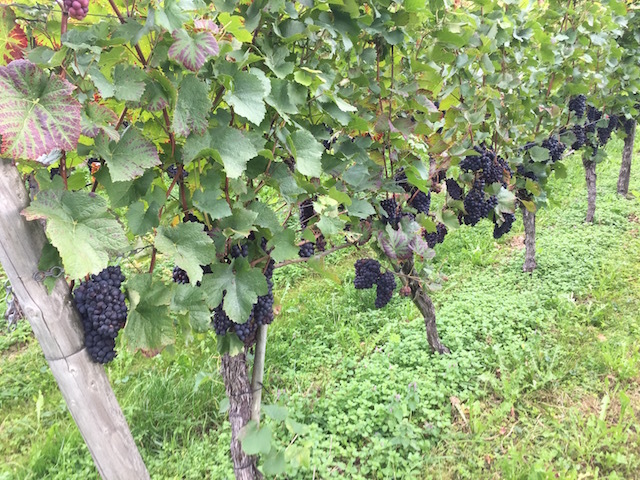 Dave tasted some of the grapes and said they were very sweet. 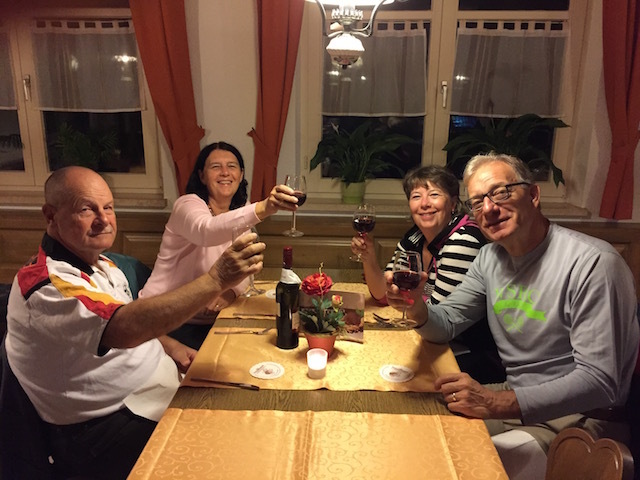 Since we had cycled by so many vineyards we thought we should order a local wine for supper in Kressbornn where we spent the night. So we ordered a Kressbornn red. I got lost twice yesterday. Once when Dave was ahead of me I came to a intersection with bike paths both to the left and right. I couldn’t see him on either path so I chose left. WRONG! After going a couple of kilometers and not finding him I went back to the intersection and went right. Eventually I caught up with my sister. We waited and waited and finally Dave turned up. He had gone back an extra five kilometers to look for me. So he got in a bonus 10 kilometers today. The second time I got lost I was in the lead and Dave turned off our route to go to our hotel. When he didn’t catch up to me I eventually turned around and went back. It had started to pour and I took shelter under a restaurant awning till he found me. By then it was not only raining but hailing so we sheltered under a playground umbrella for a bit before making our way to the hotel. We were both throughly soaked but luckily our bike rental company provides water proof packs so our stuff was okay. In the future I need to make it a priority to stick closer to my cycling companions.